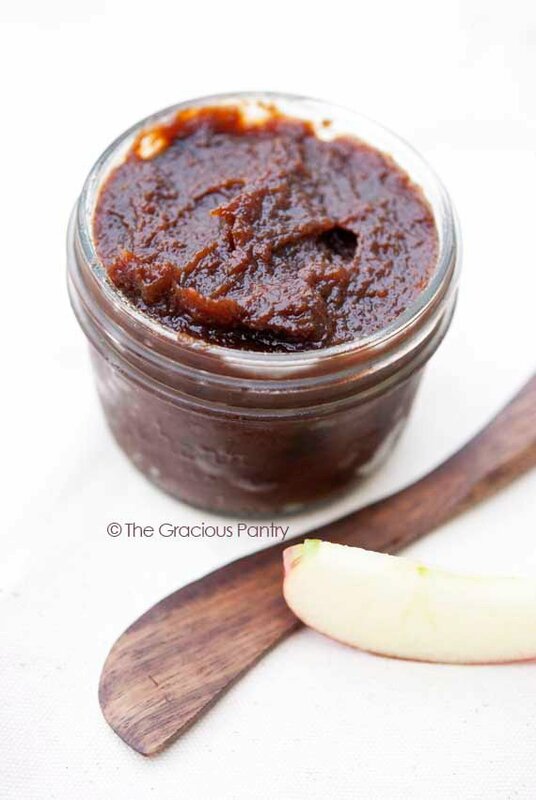 This overnight apple butter will ruin you for the store bought stuff! Love foods that cook overnight? 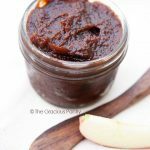 Then you should seriously give this Clean Eating Overnight Apple Butter a try! Originally, I had planned on simply updating my original apple butter recipe with this newer version. But the recipes are different enough that I thought I should just give you guys this one in addition. You can decide which one works better for you. I recently took a class from a friend who is a chef. In this class, we made some raspberry jam. But towards the end of the class, she pulled a jar of this apple butter out of the fridge and let us try some, mentioning what ingredients she had used as we tasted. It knocked my socks off! So I immediately went home and got to work making my own. It wasn’t an exact match, but definitely yummy! This delicious spread is perfect for your morning toast or even over some vanilla ice cream for dessert on an autumn evening. Combine all the ingredients in your slow cooker and stir well to combine. Vent the lid (I used a chopstick) to keep it slightly open. Cook on low for 7-9 hours. The butter should reach an internal temperature of at least 135 degrees F. before it's done cooking for food safety. Simply check it with a thermometer before turning it off. Transfer to a flat, casserole dish, spreading the butter out evenly. Cool in the fridge. Once cooked, spoon into storage containers. This should be kept in the fridge, but it also freezes well if you feel you have too much to eat within a week or so. Do not freeze this in glass jars as you risk the glass breaking. Please note that the nutrition data below is a ballpark figure. Exact data is not possible. Also, there is no way for me to know what your final yield will be, so I'm giving data for the entire batch. You'll have to measure your final yield and divide that into acceptable serving sizes to get the final data. This recipe from the Gracious Pantry archives. Originally posted 10/28/14. This would taste so good on homemade wheat bread!